It was a delight to receive postcard FI-2129218 from Finland in the last day of June. Kesäterveiset, in Finnish, means "summer greetings." In a previous post, I found the winters in Chicago, IL and Helsinki, Finland similar. However, for the summer, it seems much more pleasurable in Finland in comparison with Las Vegas. The high temperature is 16.7°C or 62°F with a low at 9,4°C or 49°F in Helsinki on July 1, 2014. In Las Vegas, an excessive heat warning has been issued for Tuesday and Wednesday, with a forecast of high temperature at 45°C or 113°F and low at 27.8°C or 82°F for tomorrow on July 1, 2014. One year ago on June 30, 2013, the temperature at McCarran International Airport in Las Vegas tied the all-time high record of 117°F or 47.2°C, first set on July 24, 1942 and next on July 19, 2005. It also broke the previous record high in June, which was 46.7°C or 116°F on June 15, 1940. 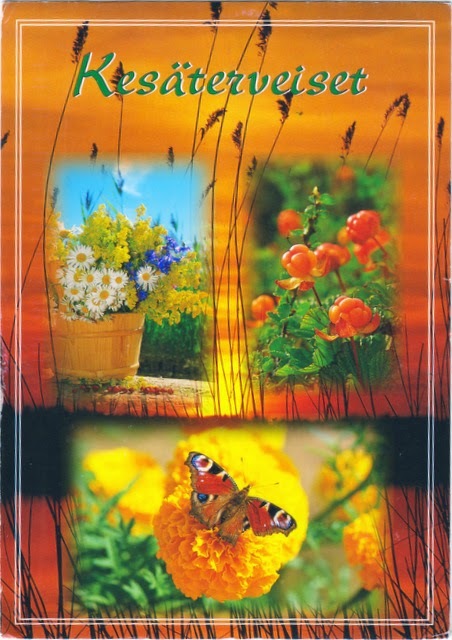 The photo on the top right of the postcard shows cloudberry (Rubus chamaemorus), native to alpine and arctic tundra and boreal forest. It produces red edible fruits similar to those of raspberry or blackberry we have here. According to Wikipedia, "unlike most Rubus species, the cloudberry is dioecious, and fruit production by a female plant requires pollination from a male plant." What else can beat the summer heat better than a glass of tropical triple fruit smoothie? 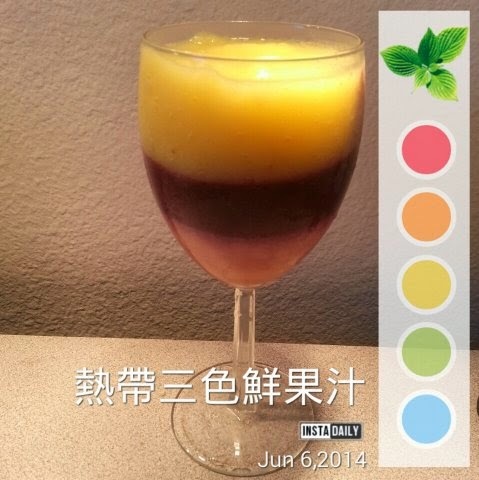 The bottom layer was blended with strawberry and banana using coconut water; a mix of avocado and blueberry was in the middle; while the top layer consists of mango and banana. I would try to substitute blueberry with cloudberry once I could find the supply.